It’s never easy dealing with California’s busy road conditions. But when a construction project impacts a well-traveled roadway, the challenges multiply. 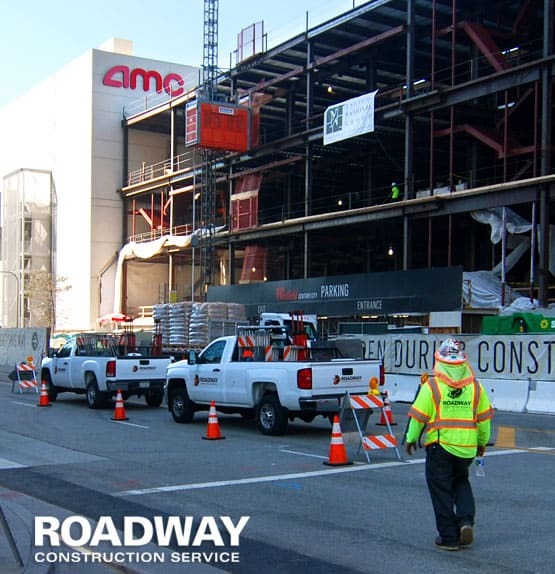 Roadway Construction Services meets these challenges 24/7/365. Not exactly a piece of cake. The task requires the skillful design and implementation of a solid California traffic control plan. This carefully-wrought strategy not only facilitates smoother traffic flow; it maximizes the safety of motorists, pedestrians, and work crews. A California traffic control plan is built on many components, each one critical for success. The first coming into play is the planning team. Noted for their wide field of vision, these experts juggle numerous variables with fine-honed precision. Planners must, for instance, consider the work site itself. What are its graphical features, dimensions, road conditions, hazards, expected weather, etc.? Planners analyze the answers and connect the dots, creating the foundation for a workable traffic control plan. Our planning team balances analytical prowess with social skills. No, they’re not chatting up the community. But they are connecting with people in a very special way. Those connected with are business leaders and municipal officials, who must authorize the necessary traffic control permits. Without these authorizations, no plan moves forward. Getting through the permitting process requires a rock-solid plan covering all contingencies. Business leaders and city officials are hawk-eyed when it comes to scrutinizing details. So, whatever you put on their plate better be thorough. Roadway Construction Service is pleased to say that we consistently hit the bulls eye. Which means we consistently come away with approved permits. Of course, we’re helped enormously by our long-term relationships with many of these decision makers. Both sides know what to expect, a situation that expedites the permitting process tremendously. Along with site conditions and permitting, a road traffic control plan must address the deployment of personnel and equipment. In the personnel department, flaggers take the spotlight. As with all other components of our traffic control services, flaggers support our commitment to safety. Thoroughly trained to meet any situation, these experts are qualified by the industry’s leading certifications, including OSHA. Not that this is the final word on the matter. Periodic classes in the latest techniques update the skills of our flaggers to give them an edge at all times. Equally important to effective traffic control is the equipment deployed. Road traffic control barricades are a major factor in this area — and with good reason. Along with flagger signals, traffic control barriers keep motorists on the right path and help prevent intrusions into closed lanes and other restricted zones. Their contribution to public safety cannot be underestimated. Because barricades play such an important role, they’re a key element of any traffic control plan. Understandably, our team expends considerable time and energy selecting and positioning these crucial barriers. From the wall-size Jersey barrier (a.k.a. K-rail) to traffic cones, traffic barricades are looked at from all angles before any deployment decisions are made. For the golden state, a solid California traffic control plan is vital. Which is why Roadway Construction Service supports all its services with the industry’s most in-depth planning. To learn more our extensive resources, reach out to our team any time. We’ll be happy to provide additional information and answers to all your questions.